Italian style fashion Mens dress shirts whether they are bright colored or two tone styles have long been known by well dressed men as one of the easiest ways to keep your wardrobe looking it's absolute best especially when finished with the right pair of Stacy Adams Shoes or even Crocodile Shoes if you really like to step it up. Variety is something that will keep you always looking well put together with little effort. 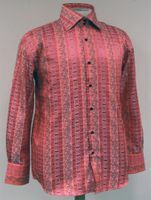 We always have fashion minded Mens Dress Shirts on Sale. If you are looking for cheap Mens Dress Shirts, ContempoSuits.com is the place for you. Keep it classy and retro with Stacy Adams Suits Here. Buy a Tuxedo with red carpet celebrity impact. You should also check out our huge selection of affordable priced Mens Suits. See what the commotion is by wearing Belvedere Shoes. Maybe you're shopping for Zoot Suits. When you dress casual, it usually means that you're still put together. 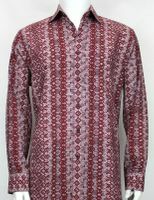 Your image is always an important consideration and casual fashion shirts keep you dressing your best. 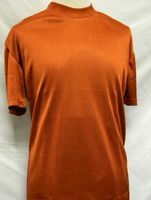 You'll find fancy print casual fashion shirts as well as solid color fashion shirts that have the fashion style you want to be seen wearing. When it comes to fancy mens dress shirt and tie sets, style counts. The type of style that has people take notice when you enter the room. ContempoSuits.com has a huge selection of the very latest fancy looking mens dress shirt and tie sets cheap in all kinds of colors and patterns that will work with what you're working with. Find stylish collar bar dress shirts with the style that will really show that you know how to put together your suit ensemble and dress to impress. These collar bar style dress shirts come in solid colors and patterns with the matching tie and hanky set for a complete designer look. Shop the same stylish mens dress shirt and tie sets in big mens sizes. You'll find these Italian designed big size dress shirt and tie sets to your liking because style counts when you're on your time. 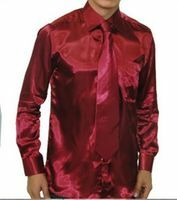 We carry both shiny satin big size dress shirts and fancy pattern big size dress shirt and tie sets. 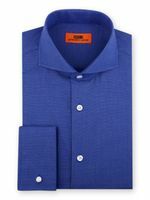 Shop mens basic dress shirts that come in tons of colors for any mood or fashion ensemble you want to roll with. You'll find our basic dress shirts that come in a comfortable regular fit with long sleeves and barrel style cuffs in any color that makes you happy. 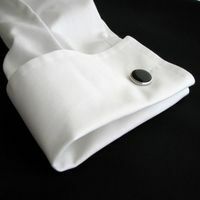 You'll find one of the Internets largest selection of Fancy Mens French Cuff Dress Shirts you have ever seen. French cuff dress shirts have an appeal all their own and if you favor the look that fancy french cuffs have when you wear suits, you'll quickly like the way they look on you and make you feel special. Nothing looks classier in the realm of fancy dress shirts. Whether you call these banded collar shirts, Chinese collar shirts or Mandarin collar shirts, one thing is clear, you'll be dressed quite stylish without having to wear a tie. 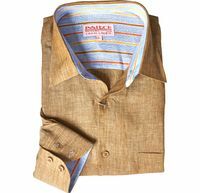 Shop stylish Mens Linen Shirts and show people you know what style really means in the Summer time heat. These mens linen shirts are a great way to look stylish and keep cool with the natural cooling effect that mens linen shirts have. 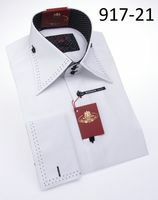 These Club friendly mens fashion high collar shirts are all designed in Italy with unmistakable Italian flavor and style. 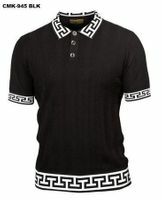 You'll find both bold colors and pattern fabrics combined with fancy and unique double style and 3 button high collars and fancy button treatments all representing Italian attitude and style that are perfect for the fashion minded man on Club night. Stacy Adams Dress Shirt will provide you the style that Stacy Adams shoes are famous for when as well as the Stacy Adams quality you crave. With Stacy Adams Dress Shirts, show the world you mean business. You'll quickly learn that the art of dressing well takes a nice suit paired up with the right Italian style fashion fancy bright colored mens dress shirts and tie combination like a two tone style which simply enhances the way the suit looks on you. We feel that You shouldn't pay too much for your Italian style mens fashion color dress shirts that we specialize in whether they are mens satin dress shirts, Two tone style Mens French Cuff Dress Shirts or our Italian designed French Cuff Dress Shirt and Tie Sets. We Stock our Italian style mens dress shirts from Fashion brands like Daniel Ellissa, Avanti Uomo and Fratello because Fast Shipping is Our Priority and we know you need to have it right now. The two tone fancy style dress shirts for men we sell with the matching tie and hanky sets are designed in Italy. It doesn't take much effort to find a fancy style bright colored Shirt and Tie Combination that will catch your eye. Mens dress shirts that come with tie combination sets are a great way to spice up your wardrobe and bring new fashion life to your staid suits that are in your closet. Imagine you have this gray suit that you've become tired of wearing but is still in great shape, just put on a brand new Italian style mens dress shirt with a new tie and hanky set and you've got a whole new look. A mens dress shirt and tie combination will give you an unbelievable number of options to improve your style. 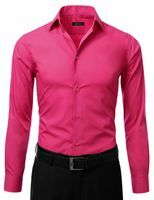 We are continually getting new styles of mens dress shirts, so bookmark us and come back often.You can find a shirt and tie combination in styles you just don't see everywhere else. If you don't know what size dress shirt you should wear Please Read How to Measure your Dress Shirt Size.Shopping Online for discount dress shirts for men is easy at ContempoSuits.com with Free Shipping over $99. Have you ever noticed how some men just look better put together when it comes to wearing a suit. If you take a deeper more careful look, you will notice that besides a proper fitting suit, the desired look will come down to wearing the right Italian fashion style mens dress shirts and a matching tie combination. It's long been known among fashion suit designers that the right style dress shirt and tie combination actually makes the suit and wearing the wrong style shirt and tie combination can do the opposite. Once you have learned which colors and patterns work for the desired suit you have in mind, you'll quickly become a natural for pair up your suits with the right dress shirt and tie combination and impart a sense of style that many just lack.